Last year I totally revamped the menu for our family Seder, moving from traditional Askenazi dishes to Sephardic ones from a variety of countries. The new orientation was interesting and most of the dishes were successful. Planning for this year’s Seder, I confronted the question of which dishes to keep and which to change, and elected to stick with last year’s for the majority. My goal is eventually to arrive at a suite of dishes that everyone is excited to see again, year after year; continuity is, after all, what Passover is all about. Thus I made artichoke tapenade and burnt eggplant with tahini and pomegranate seeds, as well lemon scented veal meatballs. 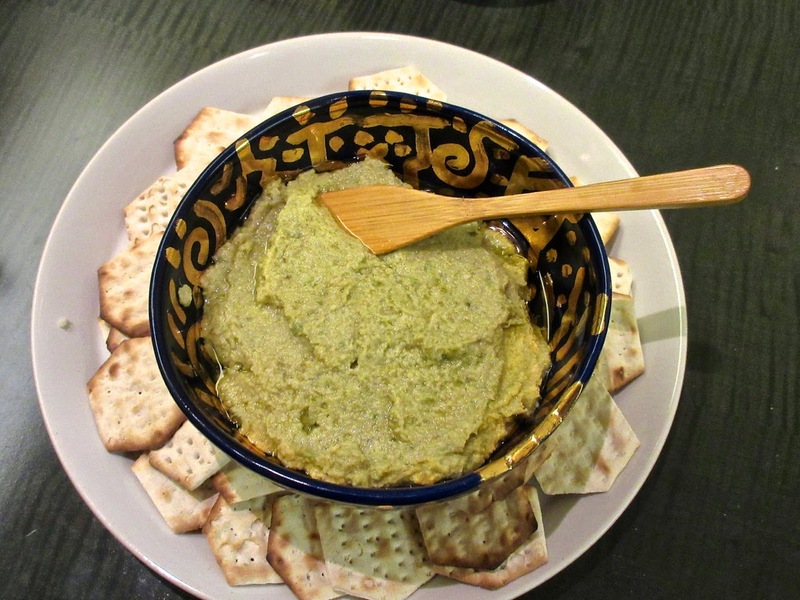 I suppressed last year’s unsuccessful dried fava bean hummus and substituted pickled mushrooms from the renowned Bar Tartine. The fifth appetizer was gefilte fish from nearby Citarella, cut into bite-size morsels and served with my mother-in-law’s wonderful sinus-clearing horseradish. The Seder plate contains two prepared elements that I love: horseradish (made by my mother-in-law) and haroset (the one I made -- Joan Nathan's haroset from Bordeaux -- consists of dates, figs and nuts only – ironically, no wine). For the dinner, I gave up the watercress and chickpea soup I made in 2014 and prevailed on my sister-in-law to make her great matzoh ball soup (not Separdic but why let purity deprive us of something great?). 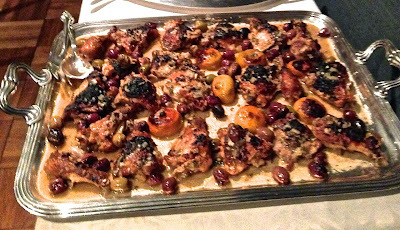 I made Syrian lemon and olive chicken (D'jah 'Limoneh) again and my cousin contributed a Moroccan lamb tagine with figs, ginger, carrots and Moroccan spices for which I provided the recipe. For last year’s Turkish zucchini pie I substituted grilled asparagus with lemon zest and ricotta sprinkled on top. 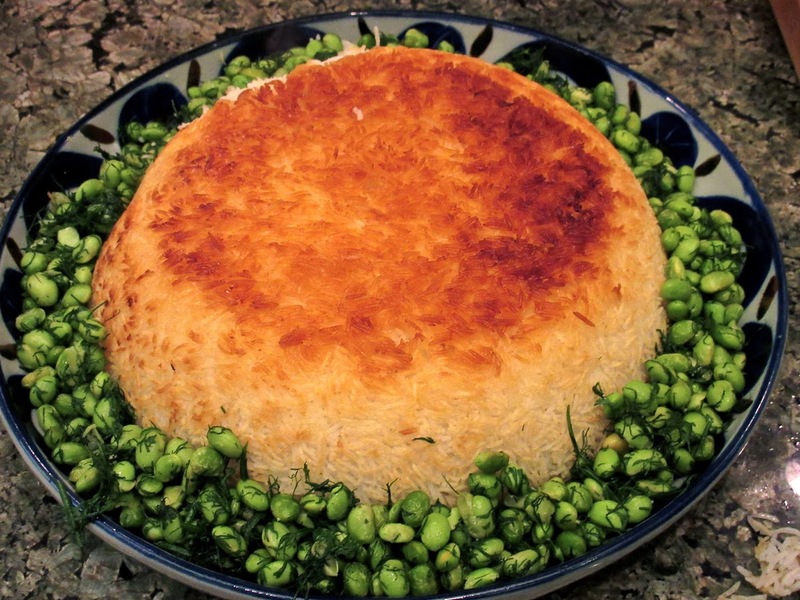 I repeated the divine Persian rice that was what inspired my “conversion” to Sephardism, with dill and edamame salad that makes an interesting accompaniment. I made a lot of changes for dessert, mostly for the worse I fear. 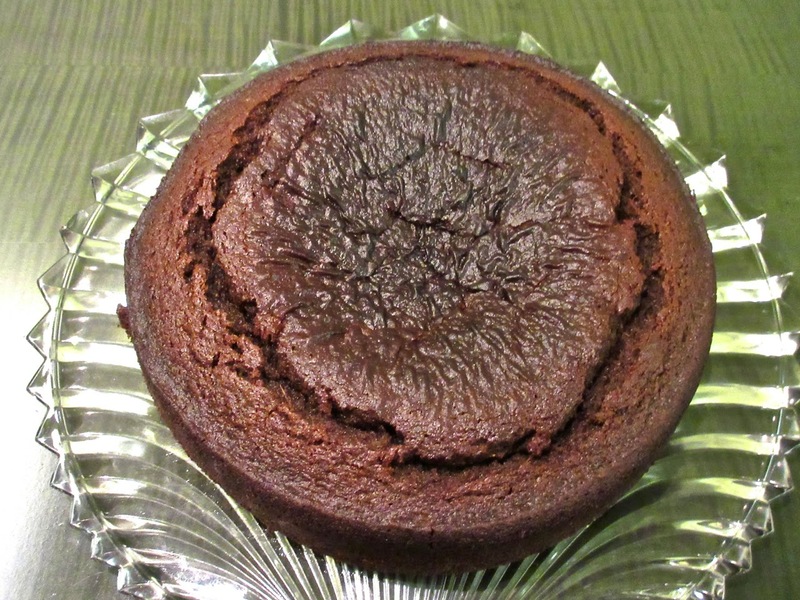 Instead of last year’s wonderful flourless orange cake I made a perfectly good but not sensational nut-free fresh ginger and molasses cake and for last year’s --- I substituted a French style apple tart, the only real flop of the meal: matzoh flour just doesn’t make a good tart dough. My cousin contributed her excellent lemon squares, chocolate covered matzohs and chocolate chip cookies, as well as some store bought items. I jettisoned the sesame halva that I made in 2014: despite numerous attempts I never got the texture right. Now for next year . . . . There would be a mutiny if I didn't make the meatballs, and the burnt eggplant is pretty compelling as I present it. Citarella’s gefilte fish is another definite keeper. But I will not repeat the artichoke tapenade or the picked mushrooms, and will be seeking worthy successors. The haroset and horseradish are fine; no change needed. Similarly, the matzo ball soup. The Persian rice will stay, although I plan to accompany it with something other than the edamame dill salad. 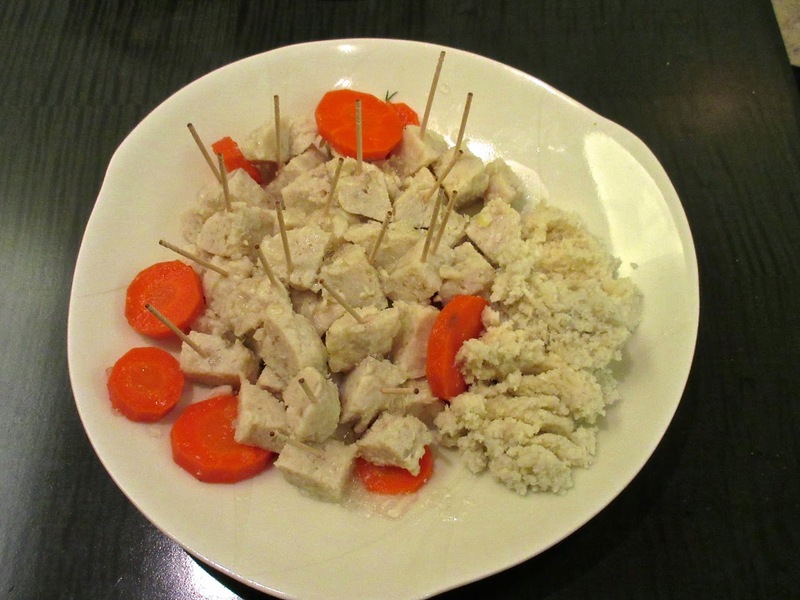 The Syrian chicken will appear again, but not so sure about the lamb tagine. J loved The grilled asparagus so I may repeat the dish but I think I can do better and remain on the hunt for a new vegetable dish. Desserts will change, but I am not sure to what. A project for the next year. Here are the sources for the dishes that made up the meal. 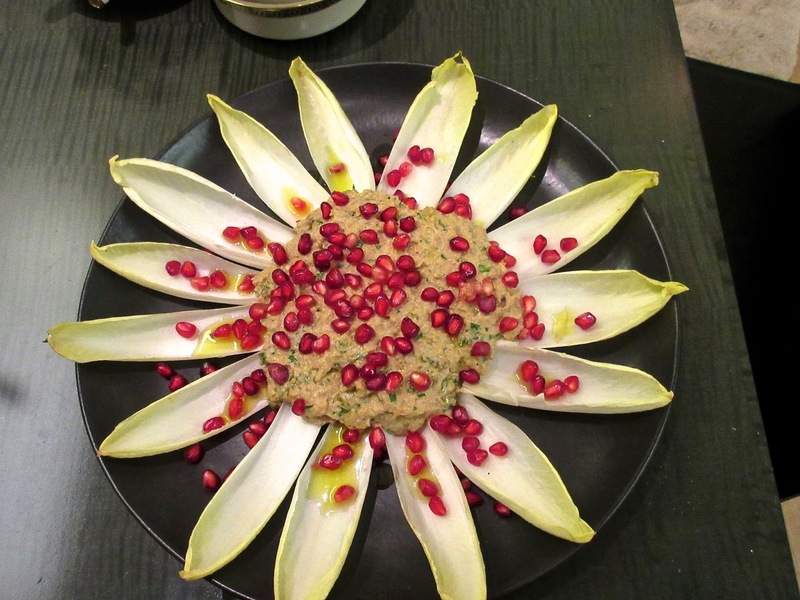 Artichoke tapenade: David Lebovitz, My Paris Kitchen. Burnt eggplant with tahini and pomegranate seeds: Yotam Ottolenghi, Plenty.Pickled mushrooms: Nicholas Balla and Courtney Burns: Bar Tartine. Lemon scented veal meatballs: Mario Batali, foodnetwork.com. Chicken with lemon and olives (Dja'jeh Zetoon b'Limoneh): Jennifer Abadi, A Fistful of Lentils. 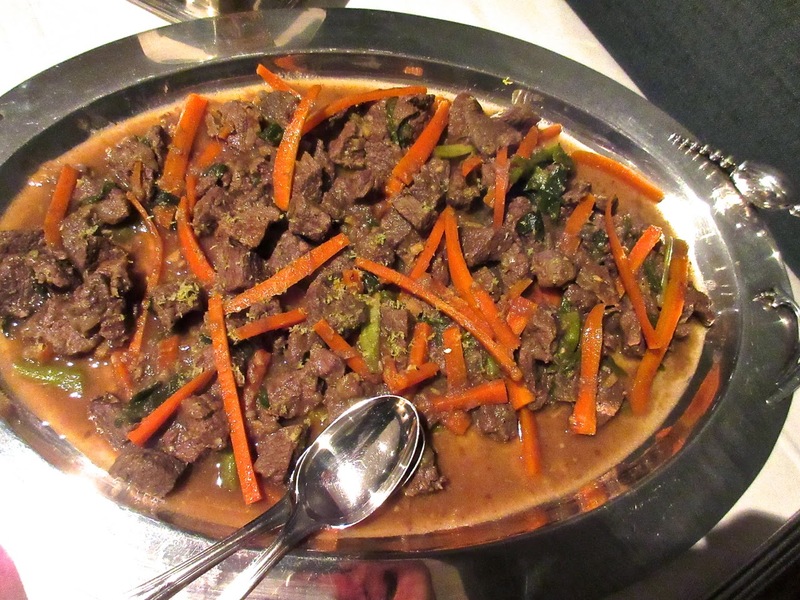 Lamb Tagine: cooking lesson at Ateliers des Chefs, Paris. Persian rice with edamame and dill: cooking lesson with Jennifer Ababi, Institute for Culinary education, for rice; Louisa Shafia, The New Persian Kitchen for edamame and dill (substituting edamame for favas). 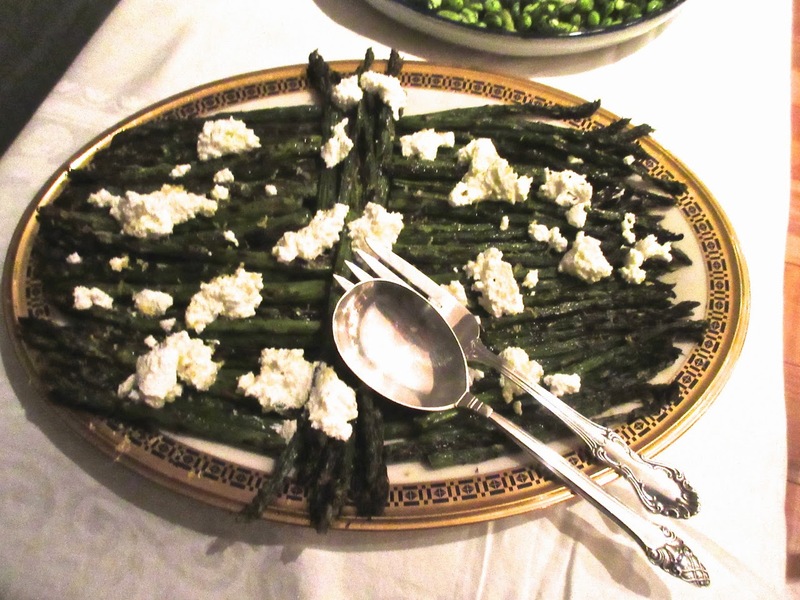 Grilled asparagus with ricotta: Yotam Ottolenghi, Plenty. Fresh ginger cake, David Lebovitz, Ready for Dessert. 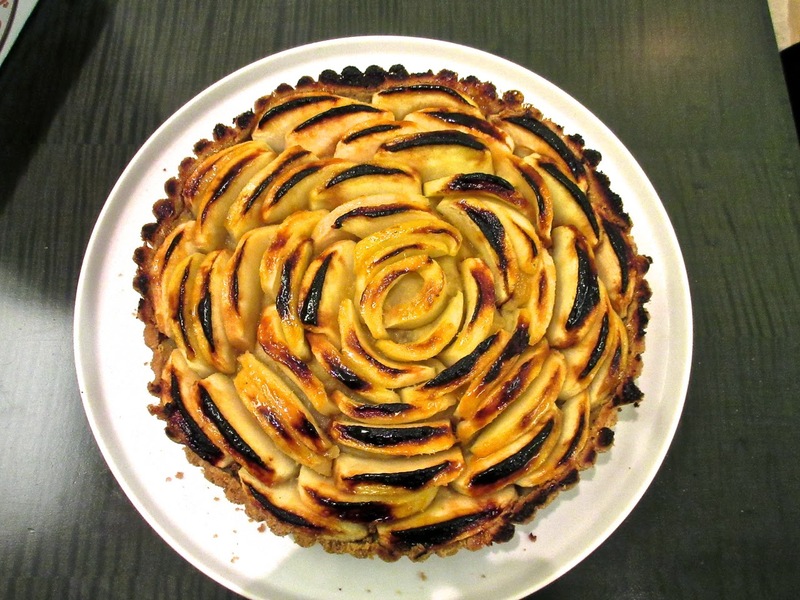 French style apple tart: America's Test Kitchen, TV Show Cookbook 2001-15. A few months ago, I wrote about the legendary chef, Alain Passard, whose three star Arpège is almost entirely vegetable focused. 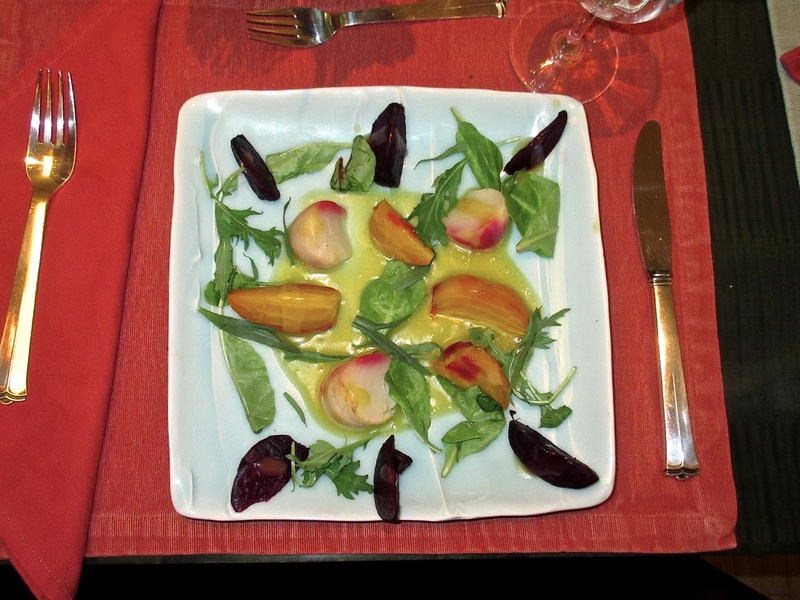 I have been viewing the videos referred to in my post of January 1, 2015, and one really got my attention: on vinaigrette aigre-doux, which means sweet and sour vinaigrette. I usually avoid sweet vinaigrettes, as well as honey mustards: for me the honey overpowers the salty and acid aspects of the experience. BUT. This is ALAIN PASSARD, who is so excited over this dressing that I had to give it a try. It helps that it takes about four minutes to assemble and contains just three ingredients: lime juice, honey and olive oil. Here's how to use it, under a salad of cut up beets and turnips, covered with a sprinkling of mesclun and herbs. A slightly different version, substituting lemon juice for lime, is perfect over triangles of pineapple (topped with paper thin apple slices and lime zest). It was also perfect over blackberries, but less good on watermelon triangles. The lesson is that it is a better counterpoint for salty or sour than for sweet. Impress your friends (and yourself) with no effort!